January 21 - 22, 2005. The first "significant" snowfall of the year was forecasted to begin in the early morning hours of the 22nd. As usual, the firehouse was a busy place with the expected weather. Overnight crews staffed E247-1, T247, and Sq247 (QRS) with a total of 12 personnel. Around 0400 hrs, 247 & 253 were alerted for a fire alarm off at Ross Elementary School. After blowtorch extraordinaire (Long) thawed out the frozen knox box, E247-1's crew made entry and reported an odor of smoke in the building. T247 laddered the building while interior crews continued with their investigation. The odor was narrowed down to a kindergarten classroom, and eventually a refrigerator motor. 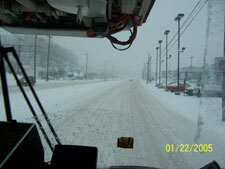 Crews returned to service as the snow began to fall. Around 0600 hrs, units were dispatched back to Ross Elementary for a repeat alarm. Crews quickly cleared the building and returned back to their nice warm bunks. The remainder of the day included a large breakfast, an auto alarm at the Northway Apartments, and a few squad runs. Thanks to all that helped staff the house. January 18, 2005. At 0935 Hrs, Station 247 was alerted with Ross West View Ems for a reported vehicle crash with entrapment in the area of the Power Plant on Thompson Run Road. Engine 247-1 was fist arriving and reported 1 vehicle on its side being supported by a chain link fence. Engine Officer (Zappas) made contact with the entrapped female and confirmed only minor injuries while the rest of the crew worked on stabilization and deploying a protective handline. Ems Rescue 40 arrived, completed stabilization, and began extrication. The pt was extricated approx. 10 mins after the arrival of Ems Rescue. Engine 2471 stood by for hazard control while the vehicle was removed. January 8th, 2005. 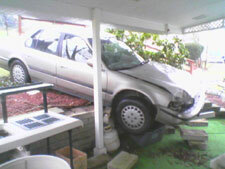 Around 1100 hrs, 247 was alerted with Ross West View EMS for a reported vehicle crash with a vehicle into a residence. Newcom quickly updated there was no report of injuries or entrapment. Units were downgraded and continued to evaluate for any other hazards. Engine 247-1 arrived to 1 vehicle into the porch area with the need for stabilization. Engine 247-1 stood by and assisted Ross West View Rescue 40 with stabilization. Units remained for approx. 45 minutes. Shortly after mopping up from the Shaler fire, 247 was alerted with McCandless Co. 188 for smoke in a residence on Fairhill Road. Chief 188 arrived and reported nothing evident from a 2 story residence. After a further investigation, Chief 188 reported a light haze and downgraded the assignment to E188 & E247. The engine crew assisted with clearing the structure with the TIC and heat guns. No fire was found and the source of the smoke was determined to be from a recently repaired furnace. All units returned to service. Around 1900 Hours, the stucture assignment was struck for Fieldstone drive in Company 261's first due. 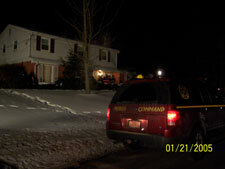 Newcom reported a fire inside of a special needs home with multiple occupants still in the building. Units from Company 261 arrived to find a good smoke condition throughout the 1 story residence, and reports of a basement fire. Company 264 arrived and established a water supply while 261 interior crews confirmed there was a fire in the laundry area that had been knocked by the occupants prior to their arrival. Truck 247 arrived on the scene and assisted with ventilating and metering the building. The fire was contained to a small laundry area in the basement. 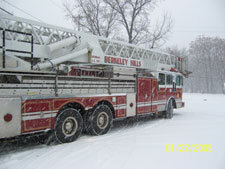 After ventilation was complete, and all occupants accounted for, Truck 247 was returned to service. On January 16 at 6:49 fire units were dispatched to 215 Andrews Drive for a residential structure fire reported by a newspaper delivery man. 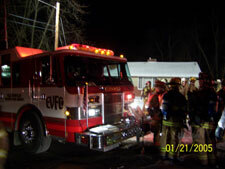 Thankfully, the bunks were full that night, and 247 Engine 1 was out the door in seconds with a crew of 6. First arriving unit was 261 C-2 who set up command, and immediately reported two confirmed entrapments. Engine 1 arrived on scene to find smoke coming from the first division side 1. 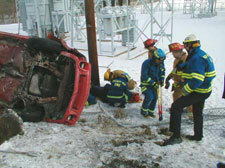 The bumper line was pulled as the operator forced the front door. Upon making entry, the first interior crew was met with heavy smoke, as well as the first victim. He was rapidly removed from the living room, and dragged into the front yard. Immediately the hydrant and break man began CPR. The second victim was extricated by police on side 3. Inside, the interior crews were met by slight fire in the main hallway. This was quickly knocked, and the crew made it to the fire room. After another fast knock, the fire was under control. The fire was placed under control after only fifteen minutes. Outside, EMS pronounced both victims. Responding units were 261, 247, 264, 149RIT, Shaler and Ross/West View EMS, Shaler Township Fire Marshal, Shaler Police Detectives, and Allegheny County Homicide and Forensic Units.